The good news is that we came home last night with the same amount of candy as last year -- and we have two additional kids this year -- so I think we showed some restraint and only took the kids to a few places for Trick-or-Treating. The bad news is that it's still a boat load of candy. I shudder at the thought of alllllllllll those candy wrappers that will be thrown away and hate that my kids will be consuming so much sugar, additives, preservatives, dyes, high fructose corn syrup and goodness-only-knows what else. But never fear! This eco-hero has done some research so that you don't have to. Following is a list of ideas from all over the interwebby to help you use up all that candy and the wrappers too. The article 25 Things to Do With All That Halloween Candy has some great ideas from stirring a chocolate into your morning coffee (I'll definitely be trying this!) to freezing it and adding it to milkshakes. Pack a bag in the car and use it for bribes. Save some for making a gingerbread house at Christmas time. Pack a piece in the kids' lunches each day as a treat. Turn your Halloween candy into Thanksgiving treats and desserts. My mother-in-law visits a friend in a nursing home each Monday and each Monday she stops at Target to bring candy for her. I don't know. I guess at that age and level of health you can eat whatever you darn well please and no one tells you no. Give it to a charity, homeless shelter, women's shelter, etc. Donate it to an organization like Operation Shoebox who can send it to our troops deployed overseas. Call your local dentist office. Ours is buying candy back from kids for $1 per pound! Organize it. Organization makes everything better for me. Mix Mingle Glow has some serious advice for organizing your candy - the stuff that goes in the car for bribery, to the office, in the freezer, and even the stuff you can use in cocktails at Thanksgiving time. Hmmm...that would definitely make for a more relaxing Thanksgiving at my house. Design Mom Gabby Blair organizes her kids' candy in little jars (photo above). Somehow this just chases away all the thoughts of wrappers and sugar consumption from my head because it just looks so darn cute. Kimberly Crandell, who has three kids and an aeronautical engineering degree, came up with 10 ways to turn leftover candy into a learning experience. "What could be a better combination than candy and science? (Well, except for chocolate and peanut butter, of course.) Take a handful of scientific principles, mix them liberally with a pile of leftover candy… and Whalah! Yummy, sugary, scientific goodness!" "Every time you enjoy a Mars/Wrigley candy product, we want you to save the wrapper and send it in, and we will upcycle the material into fun and innovative products. 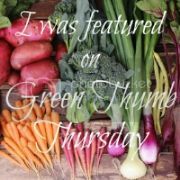 For each approved candy wrapper received, $.02 will be donated to the non–profit organization or school of your choice, so you’re not only enjoying a great–tasting treat, but also helping reduce waste while contributing to a good cause." For the next two weeks, you can send your wrappers in and receive a coupon for a free YoCrunch yogurt. 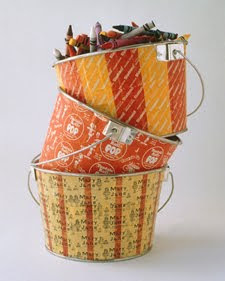 Candy Wrapper Buckets from Martha Stewart (Photo above). Candy Wrapper Decoupage from Martha. 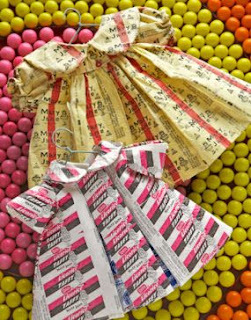 Candy wrapper doll dress (Photo below from user greenprincess60). If you have tips or ideas of your own, please add them for us in the comments section. We'd love to hear from you! wow, down under , i cant ever imagine having to 'organise' my candy. My mind boggles! Does anyone ever just say 'no'? or what about the 'trick' bit? Love it! Here we are, up with bags full of candy and clamoring kids. Thank you for the idea. Kelly: You have NO idea. A good friend moved back to Australia after 9 yrs in the US. She grew accustomed to celebrating Halloween and commented at how no one there celebrates it. She also commented how they took her kids to see a friend who celebrates, they were given a single piece of candy and were completely happy. I hate to even suggest this: but donate a batch to your school's teachers' lounge. The teachers will nibble on it or stock their desk for a rough day. Trust me. I love the craft ideas. I may be making some of them. yeah it's pretty much a non event in NZ as well. We used to decorate school books/folders with lolly wrappers, wrapping paper, ribbons, magazine cuttings. It made note-taking a lot more fun! I actually give alot of my leftover sweets to the teachers at my school. They love to nibble and they really appreciate it. I also give my kids a little treat for lunch too as well as donate the candy to my school.They send it overseas for the troops. This was an amazing article and very comprehensive. Thank for being so detailed. Loved the dresses. BTW I deleted my above comment since I had a typo in the comment. Thanks for the shout out! Such a great post of all things halloween candy!! perfect!